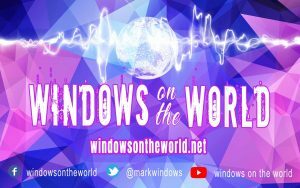 Mark Windows. 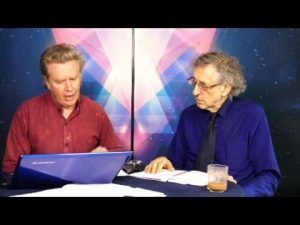 Piers Corbyn, Sandi Adams. 64 percent of populations in “Democracies” stated that their governments “rarely or never act in the public interest”. 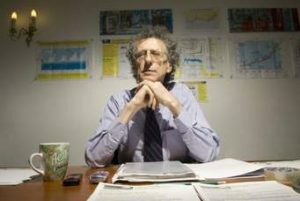 Have you ever wondered why local and national government seem to have a different agenda than the one presented to the public? The narrow corridor of accepted political opinion and the demonisation of everything outside it is also part of the Global Action Plan. The Bigger Picture shows how and why Global policies are implemented at a Local level. We reveal the the facts behind “Regeneration”, “Vibrant Communities”, “Walkable Cities”, “Smart Cities”. and why there is no real consultation but “group consensus” and policies implemented without consent. 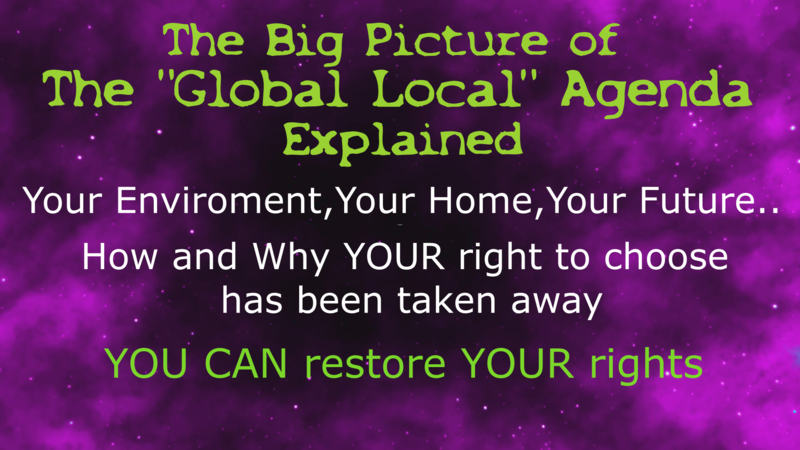 The Bigger Picture gives you the facts about everything being implemented and how this affects you and presents you with information to safeguard your rights. 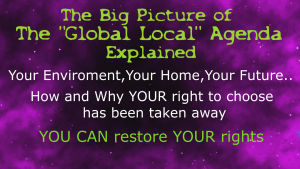 The “Global Local Agenda “and what it means to you. Piers Corbyn is an astrophycist and brother of Jeremy. An ardent campaigner for truth Piers runs weatheraction.com and his talks cover climate change and take apart the Global Warming Agenda through scientific analysis. Piers is also a campaigner for housing and covers the social cleansing and corporate takeover happening through The Global Action Plan. 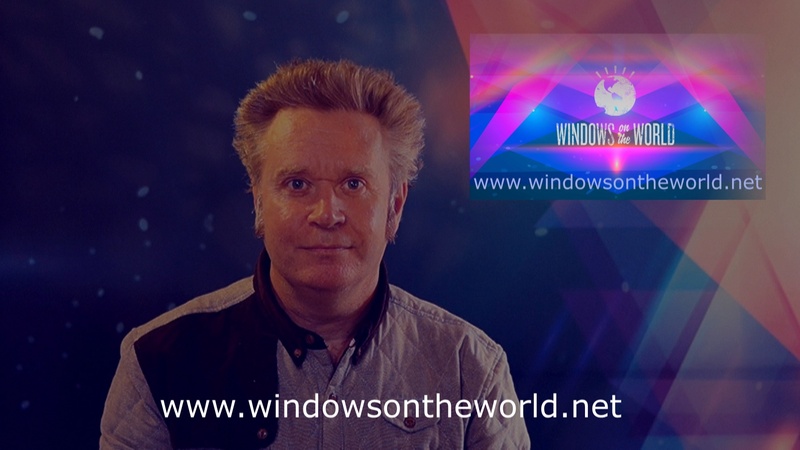 Mark Windows is an independent journalist, broadcaster and film maker looking at the bigger picture and what is really going on behind the increasingly controlled narratives presented through all forms of media.The current Technocracy or psychologically controlled worldview being implemented has been well reported on his show Windows on the World. Mark Windows talk on The Bigger Picture: The Art of Living (Beyond a Post Truth World) opens a door to World Events and how our realiy is being constructed. 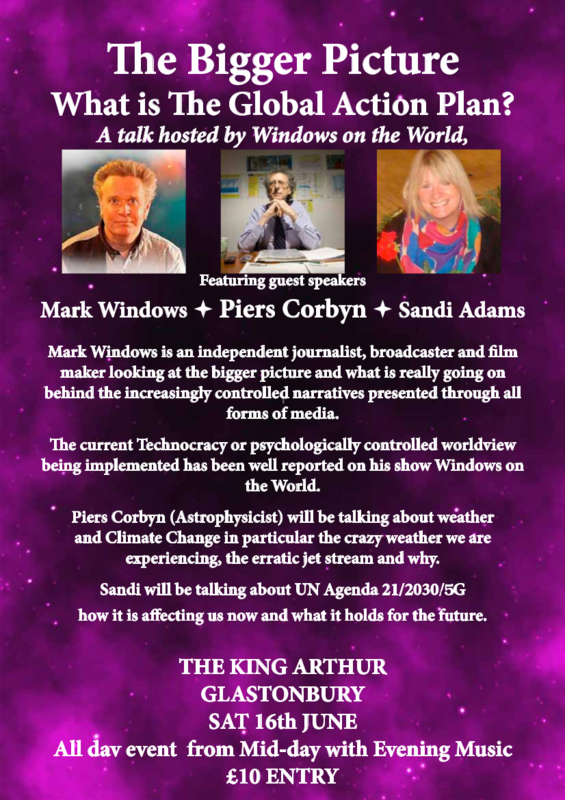 Mark Windows’ research is extensive and covers what we are perceived to be and what this means through social engineering which is getting ever more obvious through PR based Fake News Narratives being fed to the Unelected Media. Without knowledge of this there is no hope of gaining a true perspective of what is going on. 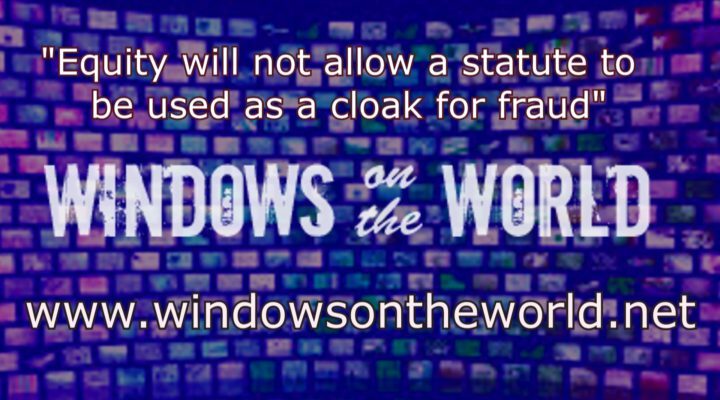 It is essential to know How, where and why your worldview is being contructed. These questions are asked and answered on Windows on the World. The agents of change are identified and the agenda carefully explained with prima facie evidence. Mark has had much success in dealing with the “Useful Idiots” in Local Councils who act beyond authority.and recently had hundreds of people removed from the “Crimestoppers” site due to the abuse of the site by Kent Police. This along with successful court cases against Local Authorities brings helpful information to you in dealing with elected Public Officials who are merely selected by corporate puppet masters. Rampant globalisation and global control is the aim of most large corporations nowadays. 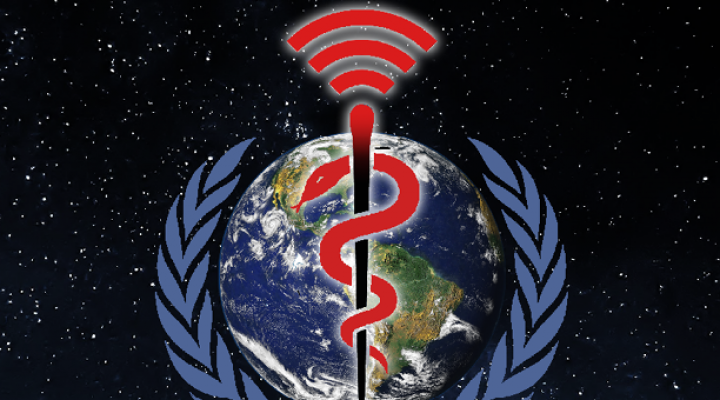 Since 2009 Sandi’s interest in UN Agenda 21, now known as UN Agenda 2030, has grown. 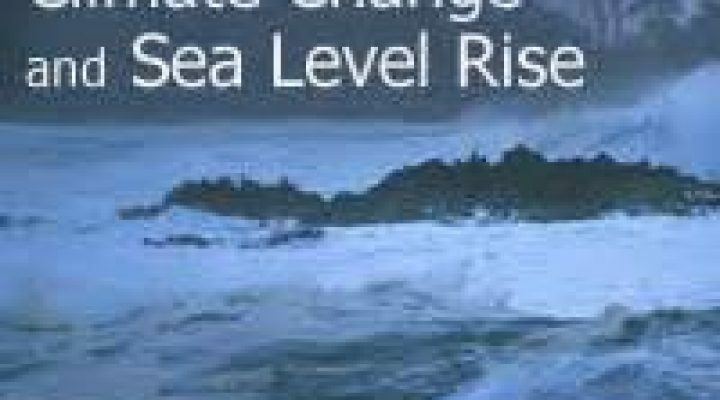 Finding that it affected Somerset during the flooding of the levels in 2014 she has been researching the origins of this global plan and has been doing talks on the subject in Somerset. UN Agenda 21/ 2030 Sustainable Development is the biggest threat to humanity and freedom as we know it. 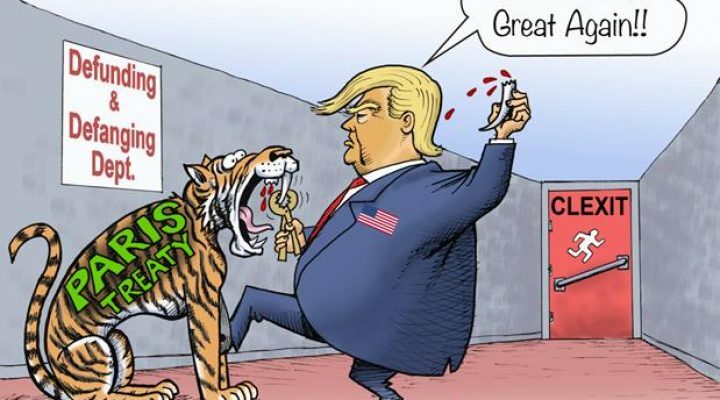 It’s an action plan implemented worldwide to inventorise and control all land, water, minerals, plants, animals, construction, all mean s of production, energy, education, information and you ! 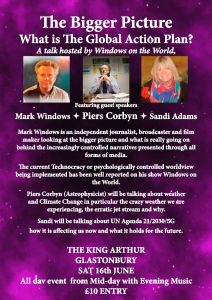 Sandi will explain the origins of the UN/EU and how Agenda 21 was born at the Earth Summit in Rio in 1992, who came up with the plan, why, what it will mean for humanity and how it links up with the Orwellian Smart Agenda, 5G and what this means for everyone. There will be breaks between talks and plenty of time to chat . Many solutions are available for those who are competent and aware, this information is shared though his shows and particularly at this talk. 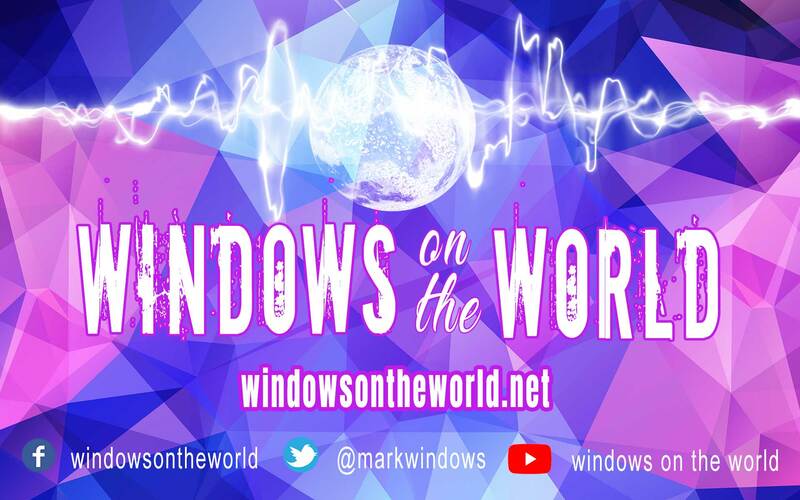 New show every Sunday 9-11pm UK. Please support us, we are completely independent and receive no financial help. This entry was posted in Land of the Free, Latest videos and tagged agenda21, Globalism, markwindows, PiersCorbyn, Regeneration. Bookmark the permalink.